Every time we go to the beach, we end up coming home with a boatload of shells. And why wouldn’t we? It’s one of our favorite things to do at the shore–collect sea shells during long walks by the water. But at this point, we’ve done a whole lot with these little beachy guys–I was looking for something a little new and a lot different. I knew we wanted us to keep the shells, but I also wanted the kids to be able to admire and share them. So instead of making beachy frames, instead of displaying them in a pretty glass jar or vase, and instead of using them as game pieces or counters, we made pretty keepsakes that we can share, paint, and use to remember our trip. 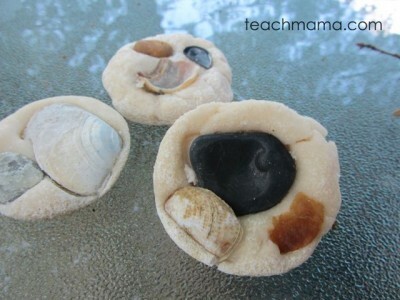 We tried a very simple recipe for an old-standby–salt dough–and we paired it with our seashell finds to create a really simple, really pretty, quite versatile summertime Sea Shell craft: Simple Sea Shell Salt dough pretties. Pretty little trinkets to display in our house or to share with our family. 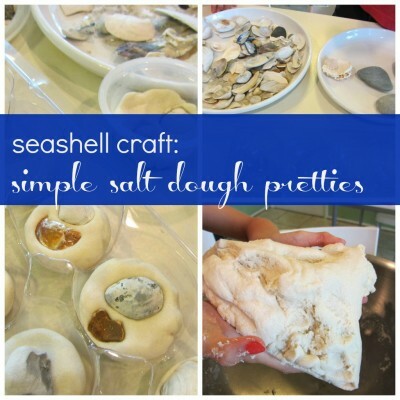 Sea Shell Craft–Simple Sea Shell Salt Dough Pretties: I’ve wanted to make salt dough for some time now, so this was a great opportunity. After our pumpkin play dough flop, I was a bit wary of any ‘play dough’ recipes, though I’m pretty convinced it was my mistake that made our play dough flop. 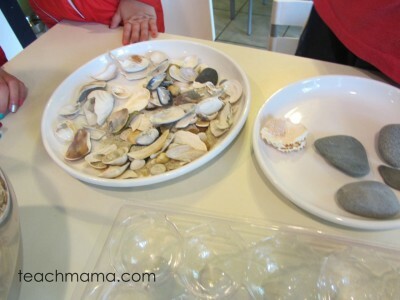 First, we cleaned our shells. . . and rocks. 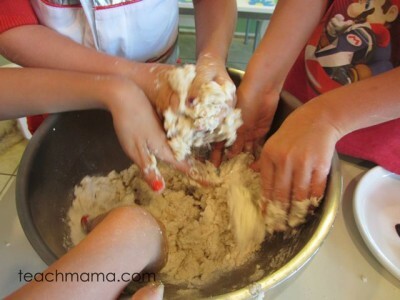 And then we started on the salt dough. So Maddy, Owen, Cora, and I cleaned off our shells and set them out to dry. 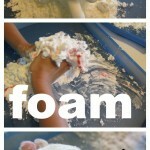 Then we created our Salt Dough. And it was so easy, I wanted to dance. And it worked so well, I wanted to dance. And the kids loved it so much, I wanted to dance. It was a happy morning. 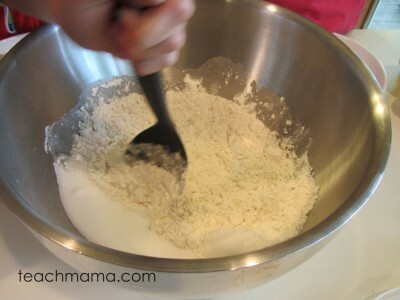 and then they mixed and mixed and mixed. . .
. . . and came out with the most perfect salt dough ever. We gathered a few recyclable items–small fruit cups, an egg carton, and an apple container from the huge discount store. We also grabbed a few yogurt cups and butter containers. 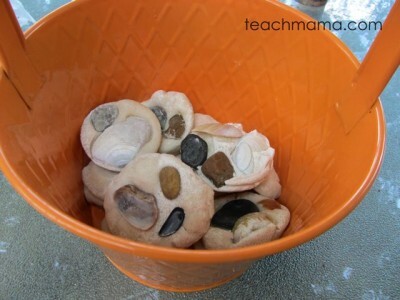 The idea was that we’d form the dough into the containers and then decorate it with our shells. We liked how the fruit cups had ‘fancy’ edges’ –we thought it would look cool when dried. 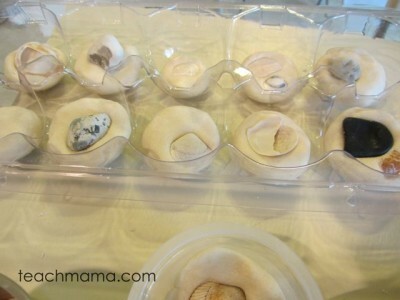 The apple carton makes a great mold for this shell craft–and so many other things! And before we knew it, we had a boatload of fancy shells all stuck in salt dough, ready to dry. We waited about 24 hours for them to mostly dry, and then we popped them out of their containers and set them on a drying rack out on the porch. We let them dry completely and then. 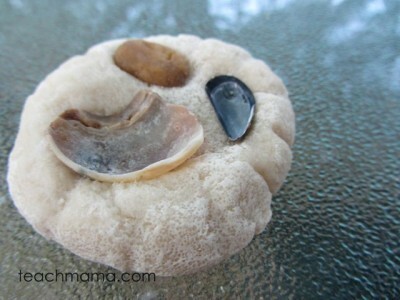 . . our Sea Shell Salt Dough Pretties were finished! I liked how they looked plain, but Maddy and Cora thought they’d look great painted. 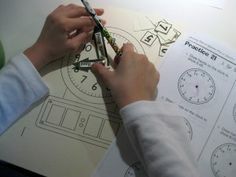 I think we’ll squeeze in some painting–if they want to–sometime this week. Before school starts. Boo-hoo. I love how these turned out. . .
. . . simple, pretty. . .
. . . seashell memories–perfect for a dresser, nightstand, or coffee table. And that’s it! 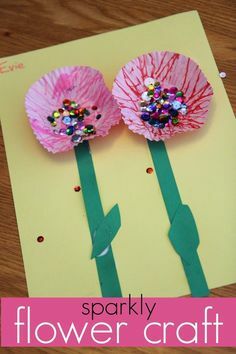 Sneaky, summertime crafting in the name of beachy memories. 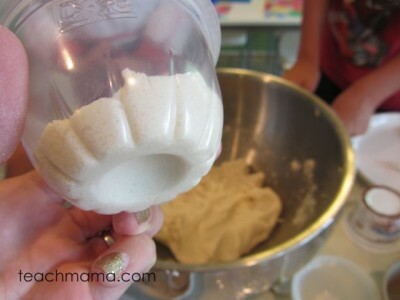 . . not a whole lot of learning but a whole lot of laughing–and hopefully smiling when we look at our Sea Shell Salt Dough Pretties and remember our awesome beach week! 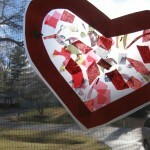 And though they’re hardly perfect–and hardly fancy-schmancy, I love their simplicity and free form. 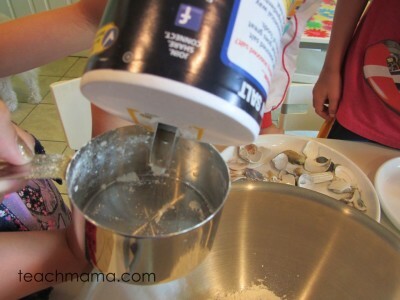 I love that the kids had a chance to re-use some recyclables, to see their sea shells added to a pretty cool craft, and that they worked together to make the super-sssschweeeeet salt dough. 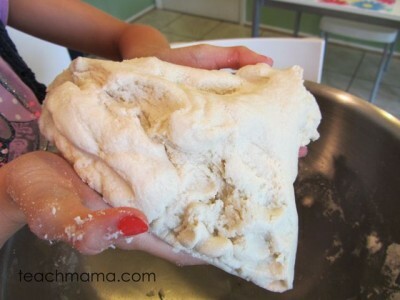 Did the shells stay in the dough after the dough dried?